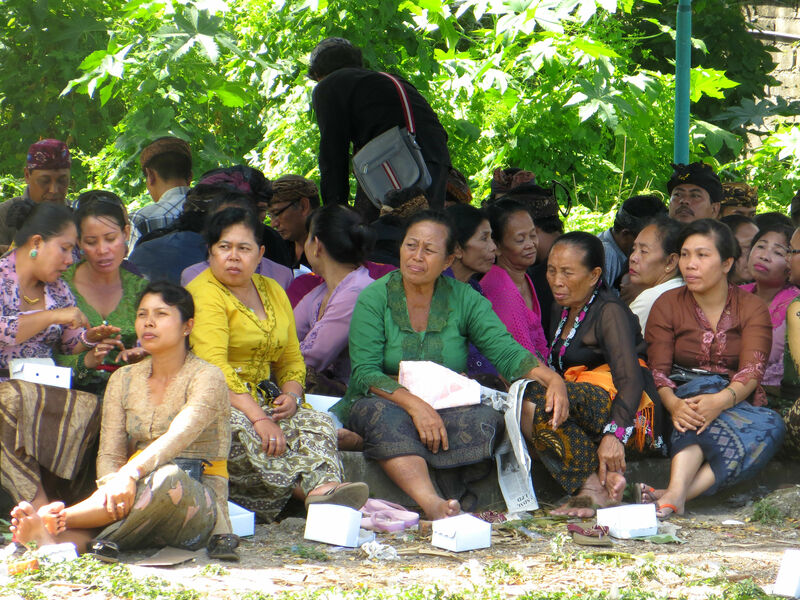 The day I saw a body being burned in Denpasar | IKIMASHO! 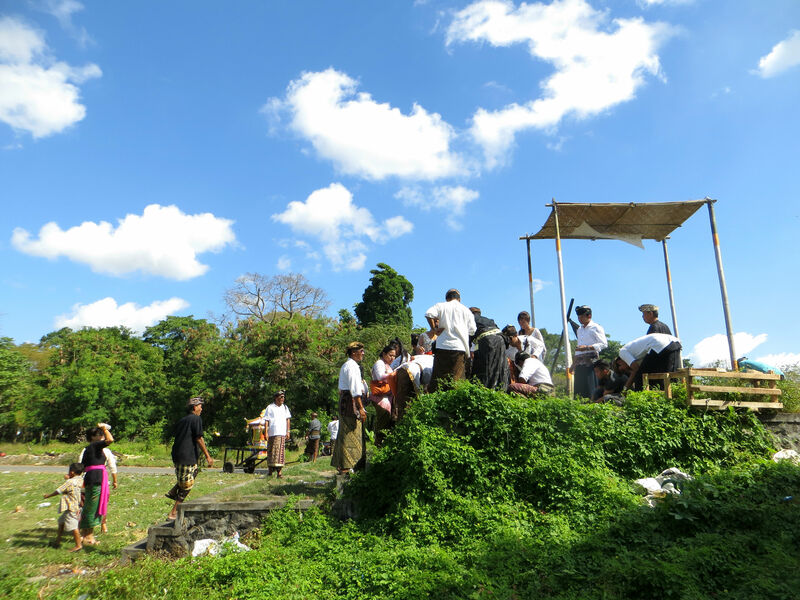 A chance encounter with Ngaben – the traditional Balinese Cremation Ceremony. My curiosity is going to get the better of me some day, I swear. Cycling round the potholed streets of Denpasar I was prepared for the traffic, the pollution, the general insanity. Pure city life in SE Asia is often a free-for-all: people selling animals (dead or alive) on the street, kids playing in desolate alleyways, a general feeling of structured chaos. I’m used to it. What I didn’t expect to find was a dead body lying in a field, being doused in petrol and then set on fire. 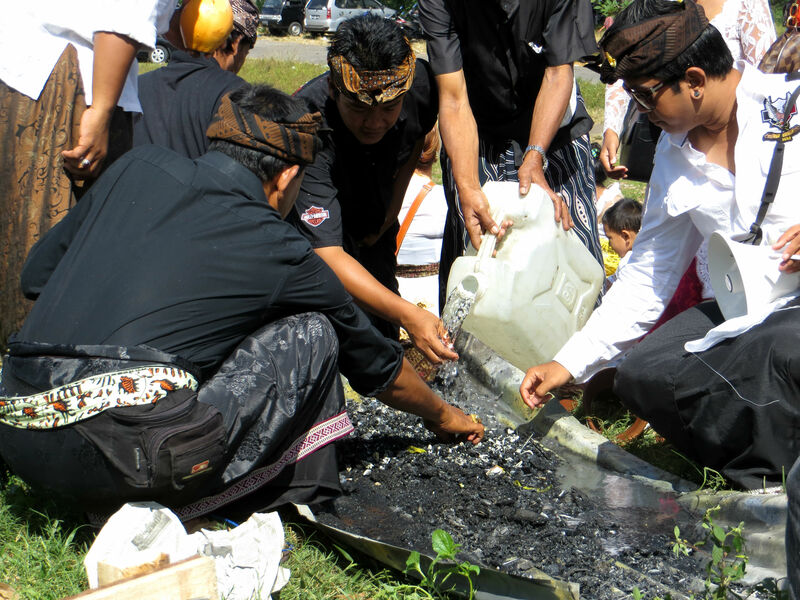 Ngaben, or Cremation Ceremony, is the ritual performed in Bali to send the deceased to the next life. Unlike in the west where death is undoubtedly a morbid affair, the Balinese believe the body is only sleeping: temporarily resting before being reincarnated or finding its final rest in Moksha. There are no black ties here. No little triangle sandwiches or tears. Generally speaking, it’s a celebration. 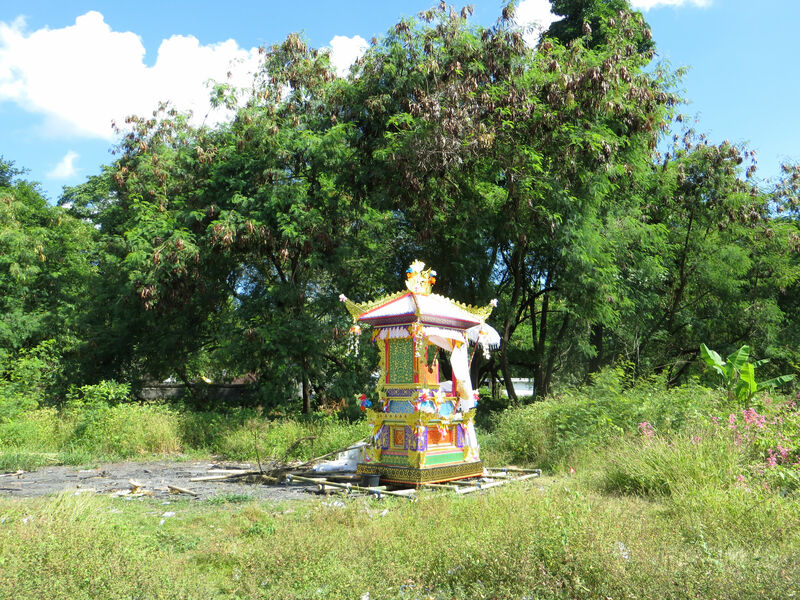 On the day of the ceremony, the body of the deceased is placed inside a coffin which is then placed inside a sarcophagus resembling a buffalo (Lembu) or a temple structure (Wadah) made of paper and wood. This is then carried to the cremation site in a procession. The procession is not in a straight line. This is to confuse bad spirits and keep them away from the deceased. 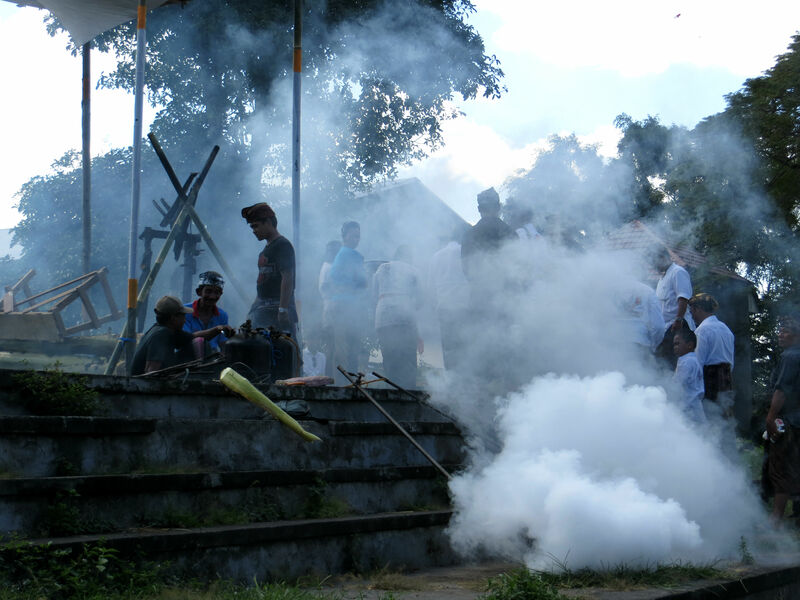 The climax of Ngaben is the burning of the whole structure, together with the body of the deceased. The fire is necessary to free the spirit from the body and enable reincarnation. A lonely Wadah awaits its destiny. My own experience saw me cycling down a busy main road only to see a crowd of colourfully dressed people walking down a dirt track into a field. There was a guy selling ice cream and even a few kids with balloons. I slowly wheeled my bike through and saw about fifty people sitting on the grass staring curiously at me. I hadn’t seen another foreigner in Denpasar that day. Evidently, neither had they. Smile and keep going, I told myself. Ash flew through the air and stuck to my shirt. There was smoke everywhere. People were breathing it in whether they liked it or not. I was breathing it in whether I liked it or not. For me, this type of experience is the true distinction between ‘travelling’ and simply ‘going on holiday’. There is a big, big difference, yet it is often hard to explain. As I brushed ash off my shirt and got on my bike I pondered to myself that I’d just saw someone being burned in a field. First time for everything. 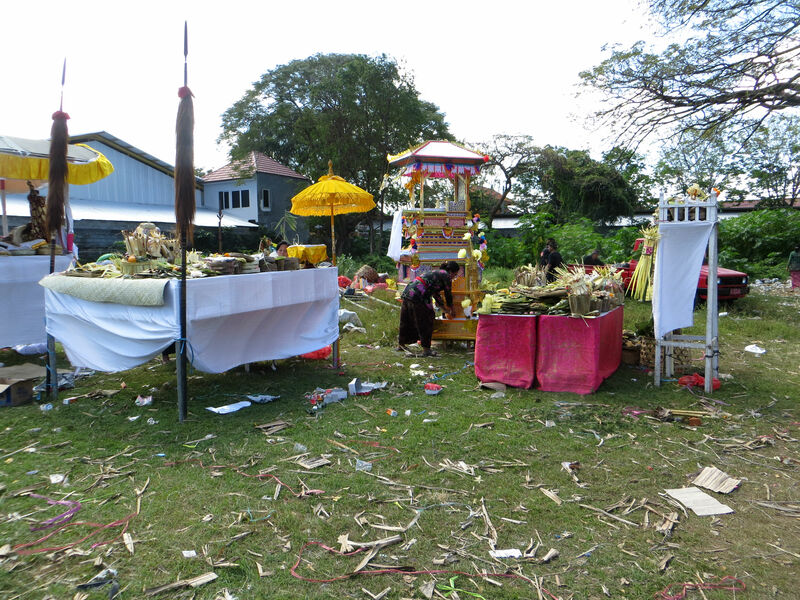 Offerings, flowers and incense cover the field before the ceremony. Onlookers, mainly women. The men are busy with the hands-on logistics of the burning. The raised platform for Ngaben. When the smoke disperses all that is left is the charred remains. While the larger pieces of bone are collected in a sieve and offered to the family. You don’t see that on the way to work from Bangor……….although come to think of it the second week in July……..
Pingback: Smoke over Pashupatinath, Nepal. | Ikimasho!